Attention coaches, managers, leaders, and entrepreneurs! 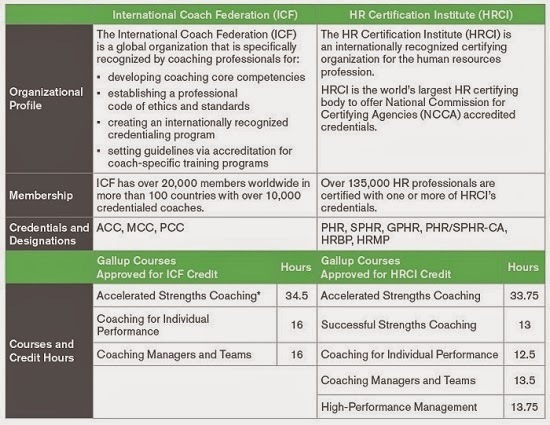 Gallup is now approved by the International Coaching Federation (ICF) as an approved coaching specific training hours (ACSTH) provider, and also by the Human Resources Certification Institute (HRCI), which is the arm of the Society for Human Resources Management (SHRM) that issues credentials. Participants in Gallup courses can now obtain hours toward credentials and recertification. For ICF, you can receive hours toward an ACC, PCC, or MCC credential, and for HRCI, you can receive continuing education hours toward recertification of a professional HR designation. Coaches and HR Professionals -- if you’re looking to obtain a credential with ICF or recertify an existing designation with HRCI, you can accomplish both by participating in Gallup’s public programs. Corporate Training -- employees from other organizations who enroll in Gallup programs will receive an added benefit of receiving hours toward their professional credentials and certifications with ICF and HRCI, without having to spend extra time outside of work. Talk about employee engagement! Entrepreneurs -- what better way to gain credibility than joining a terrific program that is approved by two of the largest credential-issuing bodies in the coaching and human resources industry? Not to mention, this is a terrific networking opportunity to grow your business and learn about exciting topics. Below is a table that outlines the number of hours you will receive toward credentials and/or recertification with ICF and HRCI, respectively.